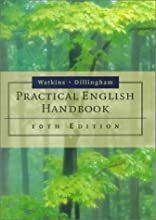 The Practical English Handbook includes concise explanations, abundant examples and models, ample practice opportunity, and help with all stages of the writing process. A coding system breaks down topics and facilitates student use. The book's compact size allows it to fit comfortably in the hand, while the durable sewn binding will withstand constant use. The MLA and APA documentation guidelines thoroughly reflect the most recent changes. About Floyd C. Watkins (Author) : Floyd C. Watkins is a published author. Some of the published credits of Floyd C. Watkins include Practical English Handbook: Updated.